In addition to hosting reports in the Geocortex Viewer for HTML5, you can host reports in Web AppBuilder for ArcGIS. See Host Reports in Web AppBuilder for ArcGIS. If you use Geocortex Workflow, you can also configure workflows to run Geocortex reports. Layer Reports: The Geocortex Viewer for HTML5 has a built-in Run a Report function that runs layer reports using the currently selected features to filter the data. To use the built-in Run a Report function, the report must be added to the layer in the Essentials site. For information about creating layer reports, see Include the Current Features in a Report. Other Reports: Reports that do not operate on the currently selected features in a layer can be run from the I Want To menu, a context menu, the toolbar, or a hyperlink using the RunReportByUrl command. These reports are not added to a layer in the Essentials site and the user does not need to select features before running the report. To configure a Geocortex HTML5 viewer to host a layer report, you add the report to the Essentials site, specifically, to the layer that the report gets its data from. Users can then use the HTML5 Viewer's built-in Run a Report function to run the report. If the layer has multiple reports configured for it, the Run a Report function allows the user to select which report to run. The Run a Report function is available in the Panel Actions menu and Feature Actions menu . In the Panel Actions menu, the Run a Report function operates on all the features in the selection set. Running the report from a particular feature's Feature Actions menu includes only that feature. Note that the Run a Report function is only available in the viewer when one or more features are selected. In Geocortex Essentials Manager, edit the layer that the report will query for data. The Create Report Wizard opens. 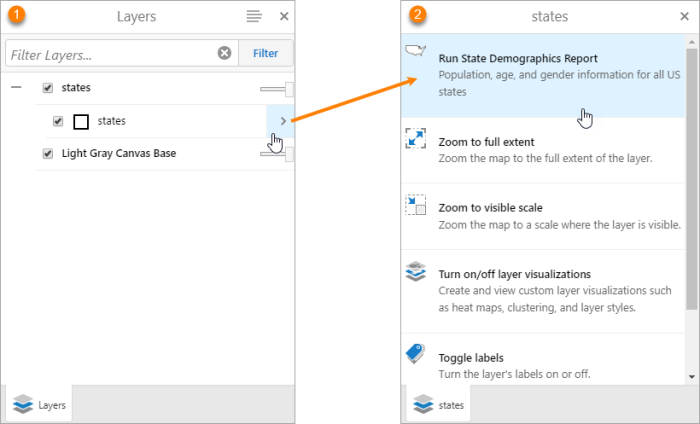 Make sure A report defined by an ArcGIS item is selected. Type a display name and description for the report. The display name and description can contain spaces and special characters. The HTML5 Viewer's Run a Report function uses the display name and description to list the available reports for the user. Type some text to search for the report, for example, a word in the report's name. Alternatively, copy the report's URL from the Info panel in Report Designer and paste it in the search box. Locate the report and select it. The report is added to the list of reports on the Reports tab. Its type is ArcGIS Item. Users can now run the report using the viewer's built-in Run a Report function. You can use the Geocortex Viewer for HTML5's RunReportByUrl command to run a Geocortex report from any context that is capable of running commands—the I Want To menu, context menus, the toolbar, and hyperlinks. This allows you to configure a viewer to run reports from locations that don't require the user to first select features. For example, suppose you have a report that includes data for all the features in a layer. This report does not use a selection set, so there is no point in requiring the user to select features before running the report, like the Run a Report function requires. Instead, you could configure a Layer Actions context menu item to run the report. This is shown in the screen capture below. The user clicks the icon to open the Layer Actions menu ( ) and then clicks the menu item to run the report ( ). Alternatively, if you have several reports that don't use a selection set, you could add a Run Reports tab to the toolbar and have a button for each report. Edit the viewer in Geocortex Essentials Manager. Click I Want To Menu in the side panel. Select the Desktop, Tablet, or Handheld tab, or click Configure Simultaneously to add the menu item to all three user interfaces. For more information, see Configure Multiple User Interfaces. Add a new menu item. Type the menu item's Text and Description. In the Command box, type RunReportByUrl. In the Command Parameter box, type or paste the report's URL. A report's URL is the URL of the ArcGIS report item. 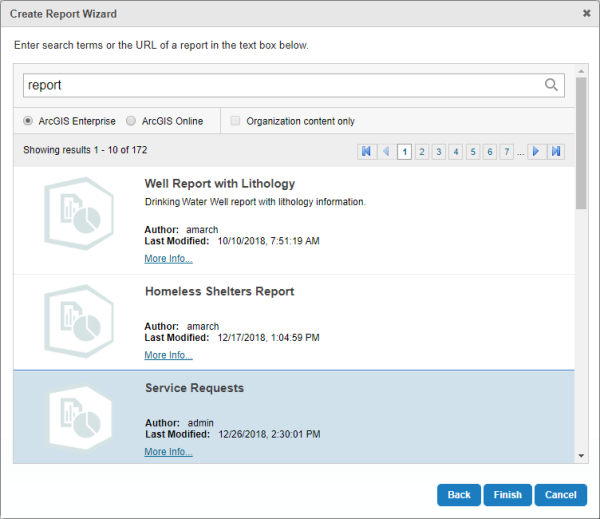 You can get the URL from ArcGIS or from Report Designer. In Report Designer, open the report, click Info in the sidebar, and copy the URL from the URL box. If there is no URL box in the Info panel, save the report. A report does not have a URL until it has been saved. You have completed the configuration. Users will be able to run the report from the I Want To menu. Click Context Menus in the side panel. Click the link for the context menu that you want to edit. In the Text box, type the menu item's text. You have completed the configuration. Users will be able to run the report from the context menu. This step creates a toolbar tab where you can place all the buttons that run reports that don't require a selection set. This is useful if the viewer will host many reports. Toolbar tabs are available in tabbed toolbars only. The compact toolbar does not support tabs. For more information, see Toolbar in the Geocortex Viewer for HTML5 help. Click Toolbar in the side panel. Select the Desktop or Tablet tab, or click Configure Simultaneously to add the tab to both user interfaces. Click Add Tab in the Configured Toolbar area. Type the tab's text in the Display Name box, for example, Reports. Running a report requires a button, rather than a tool or toggle button. To add a button to the toolbar, you add an existing button and modify its configuration. For more information about buttons, see Toolbar in the Geocortex Viewer for HTML5 help. Drag a button, for example Full Extent, from the Available Tools area to the desired position in the Configured Toolbar area. If you created a Reports tab, place the button in the Reports tab. You can reposition toolbar items by dragging them. In the Name box, replace the existing name with a name for the report. The name is used as the button's label. In the Tooltip box, replace the existing tooltip with a brief description of the report. In the Image URI box, replace the existing URI with the URI of the image you want to appear on the button. In the Command box, enter RunReportByUrl. You have completed the configuration. Users will be able to run the report from the toolbar.